We will have a Ramadan Iftar event on Wednesday September 9th 2009. 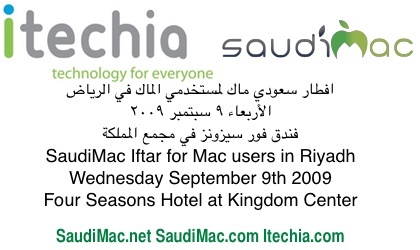 Hosted by Itechia and it will be at Four Seasons Hotel at Kingdom Center, Riyadh, Saudi Arabia. Register to attend the event on Facebook. Two more questions, if possible, number one: is this event a man only or my wife can join me on Wednesday, and number two: at which restaurant of the hotel is the Iftar being held and how much is the price per person…. Ø§Ù†Ø§ Ù…ØªØ­Ù…Ø³ Ø¬Ø¯Ø§Ø§ Ù„Ù„Ù…Ø§Ùƒ Ø§Ø°Ø§ ÙƒØ§Ù† ÙÙŠØ© Ø´ÙŠ Ù…Ù‡Ù… Ù„Ù„Ø­Ø¶ÙˆØ± ÙƒÙŠÙ Ø§Ù„Ø·Ø±ÙŠÙ‚Ø© Ø§Ù„Ù‰ Ø°Ù„Ùƒ .. Someone please send me some hi-res photos from the iftar and a brief text (who was there, how many, etc) and I’ll put it in Shufflegazine October issue. What about those who like Mac but does not yet own a mac?